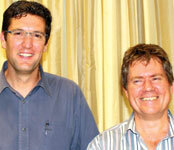 From left: Eugene Tondolo, SAFPA president; Klaus Marggraff, Hytec. At SAFPA’s latest technical evening Klaus Marggraff, system sales manager at Hytec, gave a very interesting talk on his experiences on Hytec’s sluice gate and power intake upgrade project in Sudan. The evening was sponsored by Hytec.